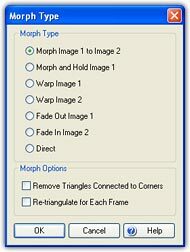 With FantaMorph, you can create "morph" movies between any two images, you can also create "warp" movies from a single source image. There are total 7 types you may choose from. It is the most used type for creating morphs. This is a special type only used for creating "Portion Morph". When you use a 32-bit with alpha image as Image 2, choose this type so that the Image 1 won't be faded out as opposed to that if choose the above type. As you can see in the sample below, it looks like only a portion of Image 1 is morphing to Image 2. In most cases, when you want to create a "warp", you can use only one source image as both the Image 1 and Image 2. However, it's also allowed to create a "warp" between any two images. As you can see in the sample below, Image 1 is warping to the shape of Image 2, but the feature of Image 2 is not presented as opposed to that if choose the type "Morph Image 1 to Image 2". As you can see in the sample below, Image 2 is warping from the shape of Image 1, but the feature of Image 1 is not presented. It is a simple but useful effect that Image 1 is fading out to black. It is a simple but useful effect that Image 2 is fading in from black. You won't see any morphing or warping effect if you choose this type. Normally, this is just that Image 1 stays there and Image 2 directly appears at the end of the morph. But if you set a Transition in Sequence Effect, you'll be able to create a nice photo slide show. Remove Triangles Connected to Corners: FantaMorph generally add 4 corners automatically while triangulating. If this option is checked, all triangles connected to 4 corners will be removed. In other words, FantaMorph will not use 4 corners for triangulation. This option is useful when you want to create a backdrop effect for the source image without alpha channel. Re-triangulate for Each Frame: FantaMorph generally triangulates the source images at the first frame of the morph. If this option is checked, FantaMorph will re-triangulate each intermediate frame. The "Highlight Overlap Zone" option was removed from version 5. In version 5, if you use "Morph Image 1 to Image 2", all the overlap areas caused by mesh tangling will be highlighted, because this is helpful to resolve the problem if you place some key dots at wrong positions. If you don't want to highlight the overlap areas, just choose "Morph and Hold Image 1".